Take a walking tour of Granada and visit the Alhambra, a UNESCO World Heritage–listed palace and fortress, on this tour from Costa del Sol. 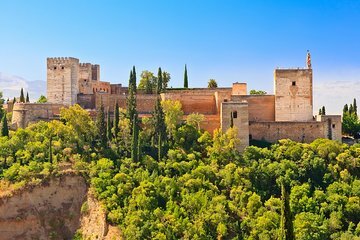 With a guide, you'll explore the Alhambra, known for its Moorish architecture, plus see the neighboring Generalife, another palace known for its gardens, and learn about the history of Granada. When booking, select the option that corresponds to your pickup location. Panoramic and walking tour of the city. Your tour starts with pickup by minivan at your selected meeting location for the drive to Granada, one of the top cities to visit in Spain's Andalusia region. When you arrive, take a tour with your guide of the Alhambra, a Moorish palace located in the Sierra Nevada foothills. Take in the intricate detailing of one of the world's best examples of Islamic architecture as you explore the palace complex, which includes the Alcazaba fortification and Palace of Carlos V. Then head to the Generalife Gardens, located nearby, and admire views of the city and the Albaycin district. Next, go with your guide into central Granada, where you have free time. Visit a local restaurant for lunch (own expense), and explore the area for a bit on your own. Your day trip then ends with the drive back to Costa del Sol for drop-off. Enjoyed the beautiful Alhambra palace and gardens. The local guide was knowledgeable and spoke English fluently. Really a good tour! We left from Torremolinos, and no one locally could get us tickets to the Alhambra Palace nor the Alhambra Gardens, thanks god this company is havind the possibility to visit the Alhambra Garden's, and we can say, the Gardens are as beautiful as the Palace... Really worth to visit, for sure seeing the prices they are asking to visit the Palace, as the gardens are the same or even better... Julia Travel did a good job for us! Thank you to our guide Paco for this great experience!